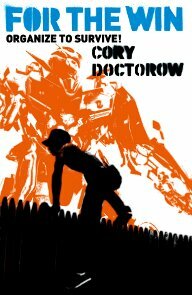 Cory Doctorow has a new young-adult novel out, and it’s something that union organisers and communicators very much need to read. For The Win meshes together the lives of people working in and around MMORPGS, the massively multiplayer online role-playing games which grow in size and value every year. Set about ten minutes into the future, it shows how these virtual worlds have developed virtual economies, with people who work in them, legally and illegally. The illegal workers are ‘gold farmers’, people who play the games for hours on end to accrue virtual goods and virtual currency, which gets exchanged for the hard currency of western players who want to buy into a more enjoyable level of the game, without the hard work getting there. The book focuses on gold farming kids in China and India, giving their back stories and describing their very unequal power relations with gold farm bosses, often connected to organised crime, and running dozens of players out of cyber cafes and sweatshops. Other kids are recruited to hunt down the gold farmers in-game – by the game owners themselves, or by rival gold farming gangs. Thrown into the mix are union activists, seeking to organise virtual workers. The IWWWW (I kid you not, here come the ‘Webblies’!) are a radical international netroots union. They haunt the games, recruiting working players on all sides of the virtual economy. Reading it, I was struck by the parallels with one of the labour movement’s key texts, Robert Tressel’s The Ragged Trousered Philanthropists. It gives a direct insight into the daily lives and perilous economic situation of a community on the edge – compelling vignettes from a huge cast of working people trapped on all sides by society and labour relations. Globalisation means that Doctorow’s community is physically atomised, but it’s no less connected than the workers and families of Tressel’s south coast town. Whether you’re a revolutionary, a factory owner, or a little-league hockey organizer, there’s one factor you can’t afford to ignore: the Coase Cost. Ronald Coase was an American economist who changed everything with a paper he published in 1937 called “The Theory of the Firm.” Coase’s paper argued that the real business of any organization was getting people organized. A religion is a system for organizing people to pray and give money to build churches and pay priests or ministers or rabbis; a shoe factory is a system for organizing people to make shoes. A revolutionary conspiracy is a system for organizing people to overthrow the government. Organizing is a kind of tax on human activity. For every minute you spend doing stuff, you have to spend a few seconds making sure that you’re not getting ahead or behind or to one side of the other people you’re doing stuff with. The seconds you tithe to an organization is the Coase Cost, the tax on your work that you pay for the fact that we’re human beings and not ants or bees or some other species that manages to all march in unison by sheer instinct. Oh, you can beat the Coase Cost: just stick to doing projects that you don’t need anyone else’s help with. Like, um…Tying your shoes? (Nope, not unless you’re braiding your own shoelaces). Toasting your own sandwich (not unless you gathered the wood for the fire and the wheat for the bread and the milk for the cheese on your own). The fact is, everything you do is collaborative — somewhere out there, someone else had a hand in it. And part of the cost of what you’re doing is spent on making sure that you’re coordinating right, that the cheese gets to your fridge and that the electricity hums through its wires. You can’t eliminate Coase costs, but you can lower it. There’s two ways of doing this: get better organizational techniques (say, “double-entry book-keeping,” an Earth-shattering 13th-century invention that is at the heart of every money-making organization in the world, from churches to corporations to governments), or get better technology. The Coase Cost is the limit of your ability to be superhuman. If the Coase Cost of some activity is lower than the value that you’d get out of it, you can get some friends together and do it, transcend the limitations that nature has set on lone hairless monkeys and become a superhuman. So it follows that high Coase costs make you less powerful and low Coase costs make you more powerful. What’s more, big institutions with a lot of money and power can overcome high Coase costs: a government can put 10,000 soldiers onto the battlefield with tanks and food and medics; you and your buddies cannot. So high Coase costs can limit your ability to be superhuman while leaving the rich and powerful in possession of super-powers that you could never attain. And that’s the real reason the powerful fear open systems and networks. If anyone can set up a free voicecall to anyone else in the world, using the net, then we can all communicate with the same ease that’s standard for the high and mighty. If anyone can create and sell virtual wealth in a game, then we’re all in the same economic shoes as the multinational megacorps that start the games. And if any worker, anywhere, can communicate with any other worker, anywhere, for free, instantaneously, without her boss’s permission, then, brother, look out, because the Coase Cost of demanding better pay, better working conditions and a slice of the pie just got a lot cheaper. And the people who have the power aren’t going to sit still and let a bunch of grunts take it away from them. This important point is where the book departs from the story arc of the RTP. Where Owen and Barrington were unable to effect real change to the inertia of their situation, the kids here have access to tools every bit as powerful as their employers’, and are able to escalate their ideas into action, talking to factory girls in their sweatshop dorms by internet radio, and spreading video evidence of actions and attacks in near real time. The Webblies try to reach out to traditional unions, but don’t find enough understanding (of the technologies, the lives of youth, or the nature of globalisation on service work) to make links, and they find they’re left to support wildcat strikes by their virtual workers and many real world workers who support them. Whilst they can defend their members online, even their surveillance and survival skills can’t the halt brutal state repression and mob violence that ensue. The human cost is huge and many characters meet with beatings, imprisonment or murder before the book is out, but by standing together across employers, job demarcations and across even continents, and by pooling their talents in an audacious plan to destabilise leading game economies, the workers win their chance to bargain for better work rights. The book is written with teens in mind, and all the significant characters are of an age to make the UK’s average ‘young trade unionist’ reach for the botox. To those of us a generation or two downstream, these workers’ relationships to technology, globalisation and each other, may cause a few double takes, but this is what’s coming to the workforce all over the world. It strongly echoes JP Rangaswami‘s thoughts on Generation M (I wrote a bit about this and unions a while back, after seeing him speak about Generation M and their attitudes to work), and indeed, Rangaswami gets a namecheck in Doctorow’s thanks list. I’d been concerned that the things that made Generation M so powerful, and such a challenge to established ways of working for their employers (loyalty to friends more than organisations, openness to collaboration and change, a willingness to vote with their feet, a dislike of compromise, and the skills and tools and skills to individually escalate their problems) might help individuals deal with personal injustices as they occurred, but mean they focused less on changing the systems that made those injustices occur. In short, if everyone thinks they can sort their problems themselves, and no-one is joining the union, the best will prosper, but who will still work to raise standards for everyone? Doctorow weaves the same themes into a much more positive frame. Generation M have a strong desire for moral good. They’re naturally collaborative, don’t respect borders and boundaries, and given the power of the new networks for people to find each other,Â a temporary team of talented specialists can spring up almost organically whenever a problem needs to be addressed (much like a temporary MMORPG raiding party comes together, pooling talents to tackle a new challenge). They can come up with solutions more innovative than the forces ranged against them can start to imagine. Go read it now, before the future gets here! Buy a copy (it’s in all bookshops, good or bad, from yesterday! ), or take Doctorow up on his kind policy of making his work available in digital form for free under Creative Commons.